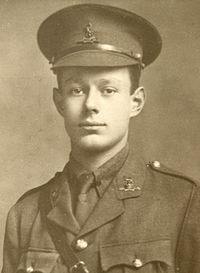 In his new second lieutenant’s uniform, aged 19, in 1914. The Oxford Dictionary of National Biography says relatively little about the First World War experiences of F.L. Lucas. He was commissioned in November 1914, as a Second Lieutenant, in the Royal West Kent Regiment. He served throughout the war on the western front and the Official History mentions his ‘daring and resourceful reconnaissance … conducted whilst British shrapnel was bursting behind him’, which brought the first indication of the German retreat to the Hindenburg line. After being dangerously wounded in 1916 and gassed in 1917, he was transferred to the intelligence corps. The war left him partially deaf. The account on Wikipedia is more informative. It suggests, on the basis of remarks in his semi-autobiographical novel The River Flows that he applied to join the army in October 1914 because of his horror at the stories of the German destruction of the library of Louvain University the previous month: “I can’t think coolly of Cambridge going the way of Louvain, of the English villages we know being trampled into tumbled brick and dust (170). In his essay “On Books” he writes about hearing of the declaration of War. I was bicycling with my father by Loch Etive and Loch Awe, when the war came and, even on lonely Highland roadsides, there bean to appear posters of a stern Lord Kitchener calling with outstretched finger for his hundred thousand volunteers. I recall what follows merely for the strange glimpse it gives of a world now vanished beyond belief. When I shyly suggested to my father that I ought to join up, my father, to whom my career was more precious than his own knit his brows above his gold spectacles and snapped angrily—’Only wasters of into the army.’ It was no lack of patriotism. He was soon to accept the harsh reality. But it was a kind of last desperate cry from that vanishing Victorian world where the soldier, though he might be idolized at intoxicated moments, as after Balaclava or Mafeking, was normally viewed by many an honest man as a caste apart, and an outcast, with some of the disdain of the Chinese mandarin for the mere brutish man-at-arms (146). Lucas spent much of the first three years of the war at the western front; except for the seventeen months he spent in hospitals. He arrived on the Somme in August 1915; he was wounded by shrapnel in May 1916. He did not return to the front until January 1917. He was in the battle of Grancourt in February, part of the Ancre Offensive, and was mentioned in despatches in 22 February. On 4 March he was gassed, and returned to hospital, before having to take a long convalescence, much of it in Dorset, where he cycled and read. He recalled his return to the front in January 1917. The battalion I came back to was a heart-breaking contrast to the one I had left six months before, when wounded on the eve of the Somme. The old gay spirit was gone. Instead, here were men too old, at 35, for the hardships; or boys that one found whimpering in the darkness as one crept the rounds from shell-hole to shell-hole by Miraumont-sur-Ancre. In that despair, nothing seemed left but to die as decently as possible: nothing to cling too, but irony. Only the Somme battlefield itself beneath its winding-sheet of snow had still the infernal majesty of Dane (Journal, 17). Hardy, D’Annunzio, Nietzsche, Schopenhauer, Samuel Butler, The Golden Bough, Pater, Heine, Rossetti, Meredith, Hafiz, Montaigne, Anatole France […] But above all, 1917 remains for me Wessex and Thomas Hardy. Sometimes I rode past Max Gate. Years after, Mrs Hardy blamed me for not daring to knock at its door. I deeply regret it. Yet it still seems inevitable. How should an unknown subaltern have the impertinence to intrude on precious time like his? (“On Books” 149). He was reckoned to be fit for garrison duty at Chatham in 1918, but he got the help of John Maynard Keynes, his fellow Apostle (member of the small elite discussion group in Cambridge), and returned to France. He was not on the Front, however; from August 1918 to the end of the War he was a staff lieutenant in intelligence, examining German prisoners. He noted that many people were happy to talk, since they were so fed up with the war; and that the German distrust of Alsatians, which led them to split them up and distribute them throughout the regiments, was very useful: “it means that most German units now contained a sprinkling of Alsatians, eager to tell us all they knew” (“Of Books”, 127). He met one friendly Fähnrich (ensign), with whom he had a friendly general conversation. What were we both going to do after the war? I have never forgotten his cry of unfeigned horror, when I said I should go back to the University, left at the end of my first year—’Was! Ein Bücherwurm werden!’ A bookworm, the next year, I again became (“Of Books”, 127). His lungs, badly damaged by the gassing, left him very vulnerable to the ‘flu epidemic on November 1918, and he only just survived. “The day after the operation I was able to devour Wells’s Joan and Peter from cover to cover. (“On Books”, 151). He returned to convalesce in Cambridge in January 1919. I am reliant on two sources: the very informative but strangely disorganised Wikipedia article, and the entry for the Oxford Dictionary of National Biography, by R.H.L. Cohen, revised by Mark Pottle. His own writings have mentions of his service: I used “On Books”, in his collection The Greatest Problem And Other Essays (London: Cassell, 1960), 125-177; Journal Under the Terror, 1938 (London: Cassell, 1939), and his novel The River Flows (published by Leonard and Virginia Woolf at the Hogarth Press, 1926).